we love road trips, road trips are fun. and it was so exciting to see these fellas. we are nerdy-gamers and because it's our latest game of choice. played it right and it was fun! and all about being gutsy + lucky. anyway, keeping a game in your purse can be nice and handy. for gannon when things got a little boring for the little man. jason and i played it (almost) all the way home. p.s. we need a new game now. take lots of brain power or strategy. Did you all ready try the name game, etc? 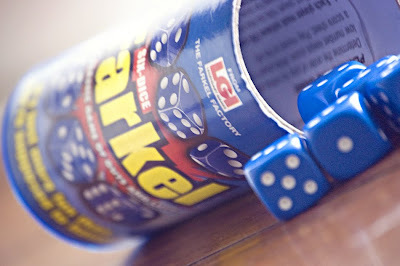 Never tried Farkle, myself. Try the game Blink. It is in the game section hanging by Phase 10, Uno and all of those. Fun & fast! I still love Qwirkle. I don't know if you could play it very well in the car though. I'm putting that game on my Christmas list as soon as I start it. I am looking for games of numbers, nothing that involves a lot of language skills. Any ideas on that anybody? Sorry to hog into your blog, Geri. it's a fave to all. maybe i should try it out sometime.